1. Jesus has my heart. 2. I adore Jane Austen. 3. I am constantly reading. 4. I love attending concerts. 5. Third Day rocks my socks off. 6. Mandisa also rocks my socks off. 7. My cat, Bella, makes me laugh every day. 8. Speaking of laughter it is possible one of my favorite things to do, ever. 9. I have a special bond with my nephew (by choice hehe) Nate Nate. 10. I think I am quite possibly addicted to facebook. 11. In fact I prefer facebook over myspace. 15 and how I cook…..
16. I am a night owl but after a shower in the morning can be quite chipper then too. 18. I adore fresh flowers with tulips and gerber daisies topping my list of favorites. 19. sometimes chocolate is a cure for what ails me. 20. I love the website www.paperbackswap.com ….who ever created it…genius! 21. also www.shelfari.com is a fantastic idea! 22. I love Vera Bradley and am a little obsessed with Java Blue. 23. I am quite shy at first but soon am outgoing and friendly. 24. I like Curious George and Paddington Bear. 25. I am constantly dreaming of my travels around Europe…sigh…one day. 26. I have a new puppy! 27. Her name is Sami….but we also call her Sam. 29. I wanted to name her after Samwise Gamgee from LOTR…and so that is where her name came from. 30. I have a slight obsession with LOTR. 31. I LOVE my job! 33. She also has an amazing cooking site. 34. Speaking of cooking I LOVE PAULA DEEN! 35. I had a blast in Savannah this summer where the highlight of my trip was probably going to her restaurant. 36. I love the David Crowder Band. 37. Butterflies are one of my favorite things in the world. 38. I am working on my photography skills…it is something I really enjoy doing. 39. I love listening to books on CD on my way to and from my master’s classes. 40. I love working with adolescents…I feel it is what God has called me to do. 41. I am a re-reader…I can read my favorite books over and over. 42. I was bummed when I found out 24 was not coming on this spring. 43. I have a ton of different movies but never seem to have time to watch them. 45. I have a thing for shoes…especially flip flops. 46. I recently joined Curves and I am loving it. 47. I have had some major issues with my lungs in the past year but I am not going to let it discourage me. 48. I think the Golden Girls is one of the best sitcoms ever! 49. I can watch 90210 over and over….man it reminds me of middle school! 50. I miss my friends so very much…especially Allison, Beth, Shal, and Shauna. 52. I love Old Navy…their clothing is great! 53. My to be read pile is actually bigger than usual right now…I cannot seem to catch up! 54. I am working on my master’s degree but have decided to just get a MS degree instead of an MA. 55. I was feeling torn between work and school and decided, after much guidance from the Lord, this was the for the best. 56. I like intensive weekend classes more than weekly classes. 57. I have a fan in my room that runs (almost) all of the time. 58. I would rather be cold than hot. 59. I love the color Pink. 60. I love Gummi dinos…they are my favorite snack. 61. I am single…and I am okay with that most of the time. 62. I am going to Tres Dias in May and I am excited about it. 65. But He is in control and knows what is best. 66. I went to Tres Dias and had an amazing time. 67. I sat at the table of Sarah and LOVED it. 68. And grew to love the ladies…what a bond we share. 69. I recently started doing WFW and it is my favorite post of the week. 72. I went to a new pulmonolgist and we find out some great news. 73. I have been having asthma attacks instead of infections. 74. So I am on a new regiment of things and feel good. 75. I am going to one of my dream places for vacation in July. 77. Along with my mom and two of her friends. 79. I am a blog reader. 80. I LOVE to read others blogs so check out my blog roll. 81. Music has a way of communicating to me when all else fails. 82. It is my favorite way to worship my Abba Daddy. 83. Speaking of my Abba Daddy I am his princess and oh so loved by Him. 84. My favorite song right now is How He Loves…written by John Mark McMillian but sung by Kim Walker. 85. I love to spend my Sunday afternoons going through sermons by Andy Stanley. 86. I love the way he teaches….it makes me want to know more. 87. I think iTunes is one of the best things about computers. 88. Right now I have about 1600 songs on mine. 89. I have been doing Beth Moore’s breaking free devotional this year and feel that it is and will be life changing. 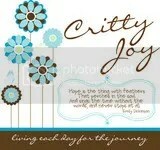 91. my name is crittyjoy so if you are on look me up! 92. I really enjoy the book tours through FIRST. 93. It has opened my eyes to many other books. 94. I have a teddy bear named snowflake that I have had for about 20 years. 95. He is one of my favorite childhood memories. 96. Along with my cousins and brother my childhood was pretty great at times. 97. I love to be surrounded by photos of my favorite things. 98. You would definitely know that if you ever saw my office. 99. Hmmm…oh I love scrabulous on facebook! 100. I am turning 30 in October…and I am a not sure what to think yet! Ah – “How He Loves” – great, amazing song! Love, love, love. I enjoyed reading your 100 list. I am right there with you on 18, 19, 20 and 44. Red tulips and pink gerber daisies are my faves. I love amazon.com because of the free shipping!